Sumac Red Onion & Cucumber Relish isn’t an absolute traditional recipe for Sumac Red Onions, or at least it doesn’t seem exactly like the condiments I’ve been served in Middle Eastern Restaurants. Mostly because of the cucumbers. What this recipe did bring was that familiar flavor, elusive flavor that comes from Sumac. And that flavor was spot on! The sumac combined with the vinegar and oil make this really more than just a relish, it’s pretty much a salad, especially with the cucumber. And it would be marvelous, too, mixed with tomatoes or kale or any number of ingredients and served as a side. Just google Sumac Red Onions and recipes will start popping up. That’s going to be helpful if you have leftover Sumac Red Onion & Cucumber Relish. We didn’t!! Funny story about the little bowl – my stepmother gave it to me and I treasure it and always hand wash it, but if you notice it is a bit strange for a serving bowl (maybe it was just supposed to be decoration) with the little creature hanging on the side. One day I found the oddest thing near my sink – it was brown and looked kind of hard and I couldn’t figure out what on earth it was! But it did NOT look good! I poked it with a knife and jumped back and it just sat there so I did what I usually do when I encounter something potentially gross – I grabbed about four inches of old rags and picked it up holding it as far away from me as I could and shoved the whole works in the garbage rags and all, trying not to look at it, trying not to lose it as my stomach heaved. Later I figured out it was the head of the poor little creature, but I keep on using the bowl – headless creature or not! I usually forget he’s headless until I look at a picture I’ve taken! Just like the other sides I made for the Home Style Chicken Shawarma, this one is drop-dead simple to make and can be made ahead. As a matter of fact, it even gets a little better with time as the veggies absorb the marinade. Herbs can be added to the salad. I didn’t add any to mine – mostly because I just wasn’t feeling running back out to the yard and grabbing some from my little herb garden. I’d already been out twice and still would have needed more, lol! So feel free to play with your Sumac Red Onion & Cucumber Relish & add parsley or cilantro or even some green onion if you’d like. I chose to grate my cucumber and wring it out in a towel so it wouldn’t get weepy and water down the dressing, and I minced the red onion. Often it’s thinly sliced but it it’s a little harder to eat in a sandwich. Cucumbers do go on sale at our store, just about every other week. Most are waxed so if the skin is used, give it a little scrub. And while cucumbers keep pretty well for the most part, once they start to go, they go fast. Have something in mind for the other half of the cucumber in this recipe. I like to make a quick dressing of vinegar and a touch of sugar and soak them for a refreshing summery side. You can mix a little sour cream with the vinegar, too, and add a little dill for a creamy cucumber salad. The red onions around here are usually huge, so I never seem to go through one all at once! I love my Pickled Red Onions for using up a little extra or else I just wrap it and use the rest in the next few days. There was a big “scare” about cut onions that is still being passed around the internet after a decade or so and it is nonsense, especially if you use clean kitchen practices. That being said, if you cut your onion with a dirty knife and lay the cut side down on your counter (counters are almost always dirty, even when they look clean) the cut side could pick up some contamination. And if you don’t refrigerate it promptly, that can grow. I just make it a practice, anyway, when I pull a half an onion out of the fridge, to trim off the cut edge. It’s fresher and no worries. Lecture over! And don’t worry, this won’t be on the test, lol! Mix together. Store in a tightly covered jar. Best if made ahead for an hour or two, even better overnight. Note: the original recipe called for fresh dill, several tablespoons. Many similar recipes call for parsley or cilantro. Add if you wish. 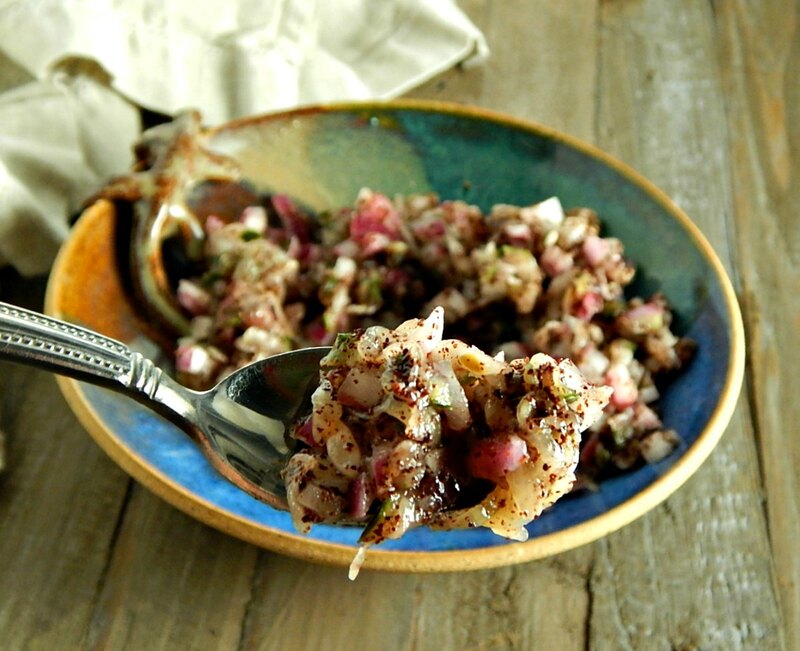 I’ll be sharing my Sumac Red Onion & Cucumber Relish at Fiesta Friday #240. The co-hosts this week are Deb @ The Pantry Portfolio and Laurena @ Life Diet Health. Stop by and check out Fiesta Friday – it’s where so many great bloggers share their recipes weekly and you’re bound to find a lot of inspiration and something to cook! So funny, Deb’s latest post is for a Garlicky Hummus and Laurena’s for a Warming Spicy Lentil Dal. No, it’s not a conspiracy! We just all picked Middle Eastern Recipes this week! Perfect for fall days! I’m sharing, also, at Fern’s site, The Lazy Gastronome on her weekly Link Up, What’s for Dinner? This entry was posted in Click here for Fabulous Food Posts and tagged Condiments, Cucumber, Middle Eastern, Ottolenghi, Red onion, Vinegar. Bookmark the permalink. Lol, what’s the creature supposed to be? Lizard? Salamander? I have a couple of handmade bowls with frogs hanging off the side. What’s up with all these ugly creatures decorating bowls? Why can’t they use butterflies instead. I have tons of sumac in my backyard. I haven’t thought about what to do. Now I know at least one thing to do with it! I think there might be such a thing as poison sumac, so check it out. I love the sumac turns in the fall! Lol about the bowls and butterflies!! Now that is cool to know! You can bet I’ll be checking the sumac that grows along our bike path now! Make sure the berries are deep red, not greenish or whitish. I’ve actually never seen poison sumac in person but I’ve seen online pictures. Make sure you google ahead of time. It was such a fun meal, too. I’m always kind of in my element when I can spin off lots of little dishes and put it together! It’s not your average get home from work and whip it out meal, though! I was surprised to find the sumac right at a local grocery – and I thought maybe I should explain the headless bowl, lol!! It was so funny because I couldn’t wrap my head around what that thing next to my sink was!! My mind went to all kinds of wild possibilities! Having a great weekend! Was supposed to go to a bluegrass festival but I just wasn’t up to the crowds, so went shopping and out to dinner with a friend. 🙂 Bed shopping. So of course, now I want a new bed, lol! Saw the cutest kitchen Island and it was $199 – great price, then went to show it to my friend and realized it was $1899! Obs, I haven’t been keeping up to date on prices, lol!! Funny!! I guess $199 would have been a great price! I’m in a new bed too. Have stayed with both of our kids here– and they have the coziest guest beds. I think we need an upgrade! And I think you headless bowl is great– things around the house that have nicks and scratches (and missing heads) show they’ve been around a while and are loved. Anyway, shopping and eating out with a friend sounds like a good use of a weekend! hugs hugs! I am simply jealous from you post. We should write a book together food and music…you have the best post! !